We have lots of Field Grown Perennials For Sale! New Horizon Hardscapes, Inc. is the creation of Michael and Cyndi Kirk. Michael has been creating and maintaining landscapes in the high country since 1994. In 2000 he changed the name to fit his vision. We are a full service exterior construction and maintenance company. Located in Boone, we provide an array of services to both our residential and commercial clientele. These services include, landscape design, landscape and exterior construction, bed and plant installation, and full service grounds maintenance (including gutters and drainage). Over the years we have added the sale of landscape materials such as topsoil, compost, decorative and quarry gravel, mulch, boulders in many sizes as well as field grown perennials. When we are creating a landscape in the high country there are many factors to consider. We work to make landscapes and the areas around a structure functional as well as aesthetically pleasing. 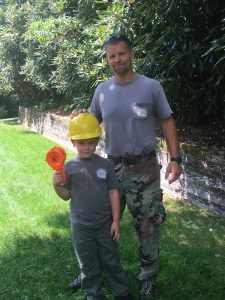 Being a North Carolina Landscape Contractor and North Carolina General Contractor, we have the knowledge, credentials and experience needed to meet the challenges of these mountains. We also hold a certification in pest/chemical applications for the lawn and landscape as well has having a Certified Plant Professional on staff. We would love for you to look through our gallery of pictures to see all of the services we offer as well as some of our completed projects. New Horizon Hardscapes, Inc. is a fully insured business with an emphasis on the safety of our employees. We all look forward to providing efficient and professional work for you.